Botox for Migraines Reviews-Pros and Cons What Patients Have to Say? What if I told you that there is one injection that could cure your migraine once and for all? I am sure you would be thrilled. However, there is no such thing as a one-time magic treatment for the pain you endure. Still, a lot of patients are willing to try new treatments. Learn about botox for migraines reviews and see for yourself if they promise some sort of relief that would definitely improve the quality of their lives. Botox injections have been used for a good number of years to smooth out wrinkles and give the face a sculptured; yet probably frozen look. Nevertheless, a lot of patients have reported that they sensed some improvement in their migraine pain. In this article, we analyze some of the users’ botox for migraines reviews who have given Botox a go. By being able to see the good and the bad, you would have more data to look into before considering such a treatment. The patient is definitely going to feel different after the first few treatments. There will be a significant decrease in the number of migraine attacks and they might disappear altogether. Patients need to have at least 2 or 3 treatments over 6 to 9 months to get the full results. However, starting from the first injection there will be a decrease in the intensity of the pain. This gives patients a bigger chance to function, work, interact with their family and friends and generally enjoy life in a better way. Some patients also love having smoother forehead with fewer or no wrinkles. Continuously squinting because of the migraine pain can actually make you look older than what you really are. Botox addresses both concerns at the same time. It is very important to do the right research before you consider such a procedure. This treatment should be done by a trained and certified doctor who knows what they are doing in order to avoid the side effects of botox. READ Migraine Aura without Headache: What Do You Need to Know? However, there are some problems that are rather difficult to avoid. One of them is bruising and pain. While the needle itself is tolerable, injection is most likely going to cause some stiffness in the injected area which could trigger migraine pain. However, most patients report that this pain doesn’t compare to the migraine pain that makes them unable to function. The pain and the bruising only last for a few days, while the decrease in the intensity of the migraine pain usually lasts for months. Since the Botox partially paralyzes the muscles, some patients report having droopy eyelids. This is one of the most undesirable side effects because it significantly affects the way the patient looks. Another major side effect is neck pain. Patients usually experience neck stiffness and pain after the injection but muscle relaxants(1) tend to help. Botox injections for migraines are fast and are not very painful. But they are not for everybody. You might want to give them a try based on your condition and how you’ve managed your migraines so far. The results are not long lasting though, which could be considered as a pro or a con. It might give you a chance to weigh this option among others as you try to find a way to cope with and alleviate migraines. 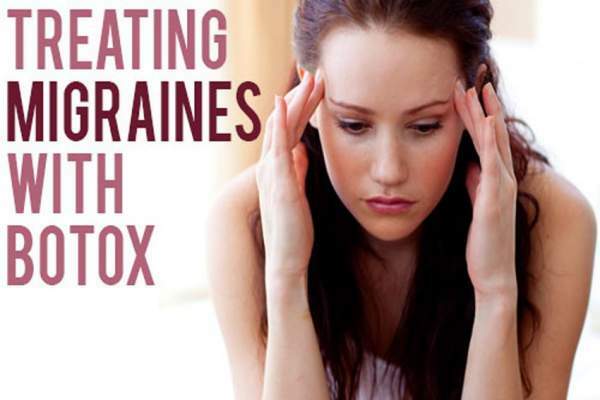 Using botox to treat chronic migraines has its possibilities, learn more.